Today, Charlene tell us how she has met Ewan McGregor. Every year I go to the Seattle International Film Festival, and in 2011 they had a fundraising dinner, along with a screening of his film "Beginners", and although it was more money than I would usually spend, I splurged, since he is one of my favorite actors. Luckily I met a friend of a friend who I hadn't seen in years at the event. We have since become good friends, and it worked out well that night since we were both there alone. After the movie and before the dinner there was a reception and a lot of people approached Ewan for photos, but the photos were taken by party event people, and you had to pay for them later online. That was fine, but my friend and I were shy about bothering him, so we never did approach him, and then they announced dinner. After dinner it was getting late and my friend suddenly got very brave and said let's go up and talk to him! We had been told ahead of time not to ask him for photos, but I had seen other people doing just that, and he seemed to be pretty accepting of it. So, up we went, and as he was heading for the door to leave, we had him a bit trapped behind the dinner tables so we kind of blocked his way and I begged him for a photo. Of course he was very nice and agreed. You could see how exhausted he was though, I can't imagine what a long day it had been for him. 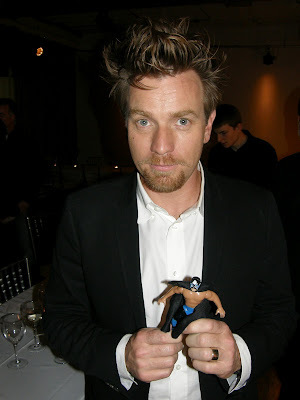 Despite that I still thought he was very generous to pose with my little plastic action figure. I joked that I would never wash Atlantis's legs again. :)"